The most recent religious violence in Nigeria has killed 21 people, most of them Christians, and according to Daniel Philpott, associate professor of political science and peace studies at the University of Notre Dame, it is all too representative of a worsening persecution worldwide. Philpott, a faculty member in Notre Dame’s Kroc Institute for International Peace Studies, writes and lectures widely on the resurgence of religion in global politics. This topic will be among those discussed at a conference on contemporary Christian martyrs, “Seed of the Church”, to be held at Notre Dame Nov. 4-6. 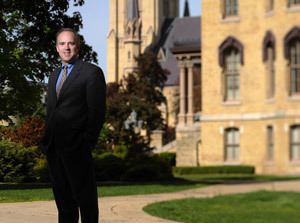 Originally published by Michael Garvey at newsinfo.nd.edu on October 11, 2012.